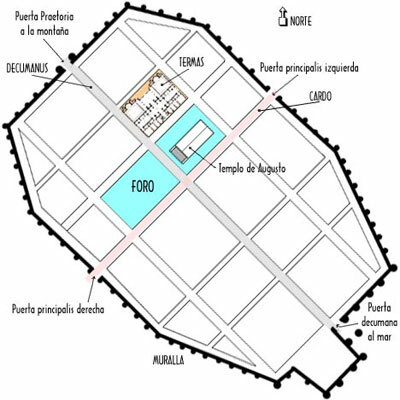 Basic plan of the city of Barcino with the most outstanding remainings. The city was founded as a colony -Colonia Iulia Augusta Faventia Paterna Barcino- at 15 b.C. It is a clear position in order to control the port on the top of a little mountain: Mons Taber. It is easy to be defended. It shows the basic urban design of a Roman city: it is crossed by a decumanus being more than 800 m. and a Kardo maximus perpendicular of 550 m. Both end at the four open doors at the wall. Praetoria door had three gates: a central one for cars and animals and both for way in and out of people. Today only the towers remain and one arch por persons. At the left principalis door an arch of the old aqueduct that took water to the city has survived. At the cross of these two streets there was the Comitium, a place for meetings and an urban center with the most important buildings: basilica, temples, termae, markets... Temple of Augustus is outstanding. Roman Temple of August at Barcelone (Barcino). There only remain four columns form this Roman temple: those placed at the superior right angle. It also remains a part of the architrave, but it is integrated in a later construction. It was a temple of 35 m. long and 17,5 m. wide. Over a podium there were columns around the whole perimeter -peripter-. 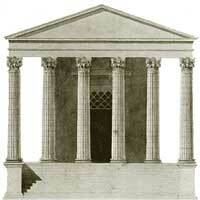 Its portico in antis was composed by six columns at the front -hexastyle-. They were crowned by composed order capitals. It was a part of the series of temples in the comitium of the Roman city of Barcino and was devoted to Emperor Augustus. His statue was in front the cella. The preserved wall was built between years 270 and 300, on a prior but worse one. As it was usual in Roman defensive constructions, it had rectangular towers placed at constant distances and major towers at the doors. The latter were poligonal or circular. In spite of being a small city, Barcino was richly developped during 4th and 5th centuries, when Empire was falling down, It became the capital town on its area, even surpassing Tarraco.